About four years ago, I heard through www.borg.com that Disney was going to produce an animated Star Wars series. It was to be set five years before A New Hope, and it would star a Jedi who had escaped the Purge along with a Force-sensitive boy who would become his apprentice. I have said elsewhere that I love Jedi, so it is no surprise that they were the “hooks” which got me interested in this story. For me, they at first overshadowed another great character in the series: Sabine Wren, the sixteen year old (at the beginning of the story) Mandalorian on the team. Now, discussing Sabine Wren means mentioning the “Strong Female Character” stereotype Hollywood and the usual suspects are praising these days, because that is what too many people want to see in her. I have maintained in my “Strong Women” posts that what really makes a woman powerful is her ability to think on her feet. She cannot always be physically stronger than the guys; in real life, it is very rare to find a woman who could match a man in hand-to-hand combat – let alone beat him. Just consider Natasha Romanoff from Marvel Comics/Marvel’s films. Even with the combat training she endured from childhood and her variant of the Super Soldier Serum, Black Widow relies on speed, stealth, and surprise when she fights. The whole reason she yells “Hang on!” into her comm piece during The Winter Soldier is to surprise the pirates and get them to come to her. She does not beat the men with her superior strength; she beats them by being faster and fighting smarter, thus proving my point that it is not physical strength which allows a woman to fight. It is how a woman uses her own innate strengths – willpower, intelligence, speed, and doing the completely unexpected – which make her strong. This brings us back to Sabine, who had the benefits of a Black Widow’s training without the bad elements. Aside from the fact that she is allowed to be kind and retain her femininity, she never physically overpowers her opponents with superior strength. More often than not she uses speed and creative thinking to take down her enemies – most of whom are taller and stronger than she is – keeping them off balance and doing her best to avoid giving them an opening to grab her. Sabine also knows how to shoot; when physical speed and prowess are inadvisable, she goes for her blasters, which she can use very effectively. One of the episodes where Sabine best demonstrates my point about strong women is “The Antilles Extraction.” In that episode, Sabine has to fight Governor Pryce, the Imperial ruler of Lothal, to escape captivity. Pryce is taller than Sabine, more muscular, and completely lacking in any kind of feminine grace or charm. (She quite frankly strikes me as ugly, face on or in profile.) Despite this, Sabine manages to defeat the older woman by outthinking her. There is something else worth mentioning here, a contrast of characters which will illustrate the difference between real strong women and the modern academy’s idea of what they want you to believe makes a “strong woman”: during their brawl, Pryce brags about her Imperial training, showing the depth of what she has sacrificed to become a part of Palpatine’s machine. By this I do not mean the fact that she is willingly subjugating and destroying her own homeworld (Lothal). That is certainly part of it. But what I mean is that Pryce has sold her soul to the Dark Side. In so doing she has erased every mark of femininity from her bearing and visage, becoming less of a woman in the process. Think about it, readers. Pryce does her best to look like the men she serves beside. Her manner is little different from Tarkin’s – colorless, stiff, cold, and distant. It is as though she does not want to be recognized as a woman. In fact, she does not; Pryce wants to be seen as a bigger, more important cog in the Emperor’s atheistic governing system. She has done everything but actually change her gender to look less like a woman and more like a man. Sabine has done the exact opposite. Her armor is not designed to hide her femininity; on the contrary, it practically screams it to the galaxy. And, despite the fact that she keeps her hair short to fit under her helmet (and probably to keep people from grabbing it), she colors and cuts her hair in ways that make her stand out as a young woman (even that hairdo we see her wearing at the end of the series didn’t really undermine her femininity). Unlike many modern “examples” of so called “strong women” Sabine actually fits the role, demonstrating that a woman fights not out of anger or hatred, but to preserve the beauty and wonder she sees and loves around her. Truly strong women resemble Sabine, while faux strong women more often than not look like Pryce. This brings us to another point I want to make about her. While I am not a fan of abstract art – modern or in a galaxy far, far away – Sabine’s painting and artistic side have never bothered me the way they have other viewers of the show. 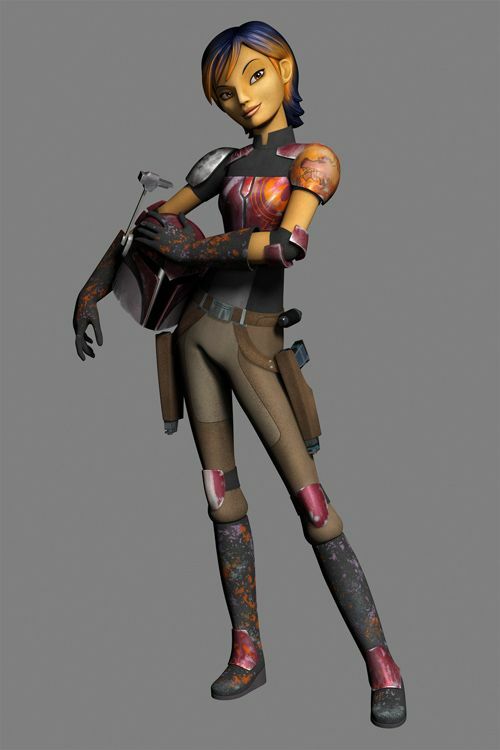 Instead of following the “Strong Female Character” template demanded by the academic/journalistic complex, the Rebels’ writers created a heroine who is unafraid of being “girly.” This adds to her character and personality; she may make her living fighting, but being a warrior does not define who and what she is. It is a valuable part of her, but it is not the whole of her. Allow me to explain: Imperial cadets, according to Rebels, are accepted into Stormtrooper and officer’s training as young as fourteen. Sabine had to have been fourteen or even thirteen when she entered the Imperial Academy on Mandalore. This meant that she was suffering from a case similar to the one running rampant in the 1960s. One of the things every boy and girl, no matter how bright and talented, has at the age of thirteen/fourteen is a rather simplistic view of life. They are still young enough at that age to believe in their family and friends, wholeheartedly. They are also naïve enough not to recognize all the dangers lurking in their society and in the world outside of their culture. Sabine was young enough to think she could run to her parents and tell them what the Empire was doing, thus spurring them to fight against it. If they did not listen to her, then she would start a glorious revolution against the Imperials with other young Mandalorians to free her people from their tyranny – which is, sadly, what many youths in the ‘60s and today are trained to imagine. Like these misguided young people, Sabine failed to realize up until “Legacy of Mandalore” that things do not work out so easily in real life. Ursa and Alrich Wren knew this. Many of Sabine’s friends, who may have agreed with her, realized they were not going to get support from their clans or anyone else on Mandalore to start a fight with the Imperials. Sabine did not realize any of this – not completely, at least. She certainly did not see any of these things the way an adult would. Or she thought these obstacles could be overcome more easily than they were. After all, what is pain and loss to someone who is motivated by justice? Sabine failed to realize that even those who love and respect justice can be tired or frightened. I think that, when she told her parents about the weapon she had created for the Empire, they believed her story. They knew she was telling the truth, that the Empire did not just want to rule them, it wanted to eradicate them. But they did not have the power to act on Sabine’s warning, so they tried to tell her to stop talking about it and wait for a better time to act. Naturally, their daughter would not and could not do that. Already guilt-ridden over the Mandalorians she had helped the Empire murder, the thought of staying silent long enough for the Empire to kill more of her people probably made Sabine sick. So she kept talking, leaving her family with no way to protect her while she stayed on Mandalore. That meant their only recourse was to force her to run away by calling her a traitor and a coward. Because she was so young, Sabine perceived this as “abandonment” when it was actually a last-ditch effort by her immediate family to protect her the only way they could. I believe that if the Wrens had had a better way to protect her and begin a resistance to the Empire, they would have taken it. But their choices were to let the Empire kill Sabine or, almost as bad, make her run away from home. At least if she ran, she would be alive. Letting the Empire and the other clans kill her would mean they would never get their daughter and sister back. And that, readers, is where “Legacy of Mandalore” comes in. Here Ursa practically admits to her daughter that she pushed her to run away to save her life. Countess Wren could protect Tristan and their clan with some fancy political maneuvering, though that meant her husband would have to go to Mandalore’s capital as a veritable hostage to ensure their good behavior. The only member of her family she could not protect if she remained on Mandalore was Sabine. For five years, however, her daughter did not see this. Maybe she did not see it until her mother shot Gar Saxon to save her life. This is why she is so distrustful at the beginning of Rebels. It is also why she adopts Hera, Kanan, and Zeb as her surrogate family. In some ways, it is funny how Sabine’s adoptive family/crew is different from her real family. Hera, obviously, has been the mother for the crew from the beginning. Although the Twi’lek is “forged” for and by war, her general deportment is warm and nurturing. Even when Hera has to get sharp or shout, her voice lacks Ursa Wren’s steely bite and commanding snap. Their attitudes could not be more different, but Sabine loves and respects both women equally. Zeb is not at all like Tristan Wren. I still do not know if Sabine is younger or older than her brother, but the impression I have is that Tristan is not her kid sibling. Zeb early on showed an older brotherly protectiveness for the young Mandalorian girl, usually by pulling her toward him in order to shield her from explosions. When the crew temporarily lost the Lasat in “The Honorable Ones,” both Sabine and Ezra ran up to him with the excitement which youngsters show when they greet an older brother feared lost forever. So Zeb has definitely filled the role of brother for her for five years. Kanan and Sabine’s relationship struck a better balance with me. I detailed my opinion of “The Protector of Concord Dawn” in previous articles about the series, and it still stands as one of my favorite episodes. Kanan, like Alrich, is willing to try things the “easy way” before resorting to shooting. However, when the blaster bolts start flying, he is equally ready to fire and fight back. This is something Sabine respects and loves him for. The next time we see their rapport in a palpable way is during “Trials of the Darksaber.” Where “Dawn” showed the two working past their differences in order to understand each other better, “Trials” shows them at odds once again. Here Sabine is being asked to go to her people to win their support for the Rebellion. But this time, it is not a small band of Protectors or outlying clansmen she is being sent to recruit. This time, her “battle family” wants her to bring Mandalore and all its colonies into the Rebellion. Sabine does not want to do it. She still feels abandoned and betrayed by her family; even though she wants to go back, she knows her people despise her as a traitor and a coward for running away, thinking at the same time that her family believes the same lie. But Hera insists she go, and in order to do that, she has to take the Darksaber with her. 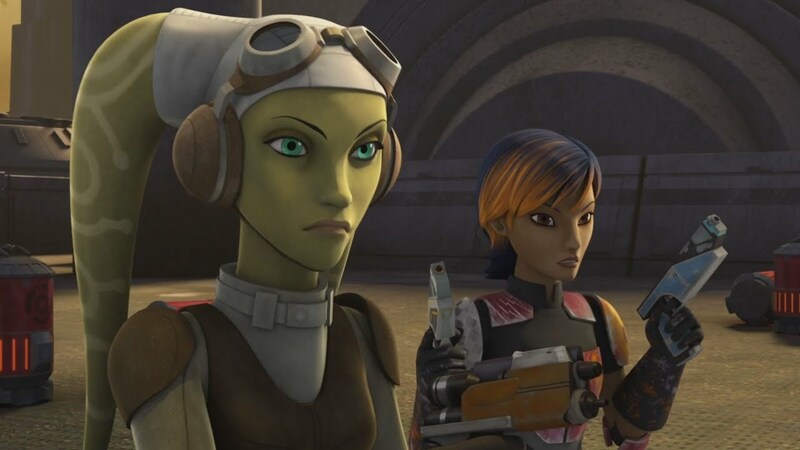 Fuming over the order, Sabine nevertheless holds her hand out for the weapon, which Kanan refuses to give her. Though she states that she knows how to use blades, he insists that there is a difference between using a lightsaber and a regular sword. Before he will let her use the Darksaber, he wants to train her to use a lightsaber. This increases Sabine’s anger. Not only does her biological family think badly of her, apparently so does her surrogate father. He does not believe she can handle a lightsaber, even one as old and storied as the Darksaber, without going through the baby steps first. And this is where Sabine’s youth shows itself again, tilting her attitude in favor of that misguided sixties mentality I mentioned earlier. 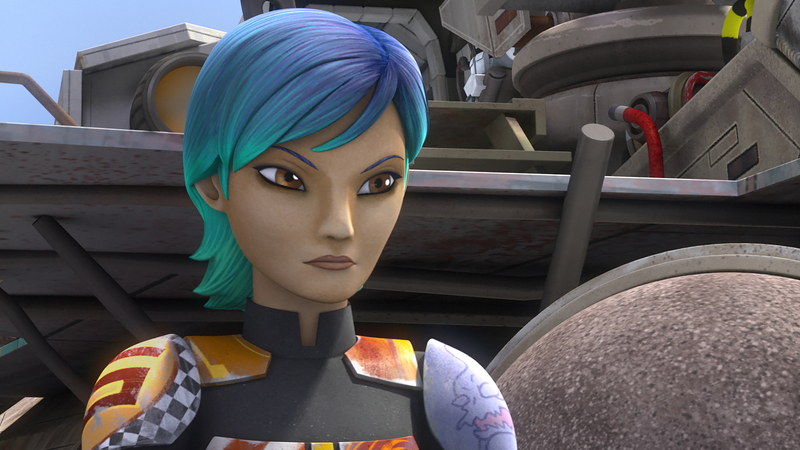 Like Ezra in “Twilight of the Apprentice,” Sabine thinks Kanan does not believe in her and is trying to hold her back. In the folly of youth and the pain of her past, she does not realize Kanan is trying to protect her from herself. He can sense the pent up anger and pain she is feeling because, as he explains to Hera, the Force flows through everything and everyone – whether they can use it or not. If Sabine gives in to her dark feelings she will slip over to the Dark Side, perhaps becoming lost to them all forever. Hera’s answer to his explanation and fears irked me somewhat, since she also played the “you don’t believe in her” card. That was not what was happening; Kanan believed in Sabine wholeheartedly, trusting her with more than he even trusts Ezra in some cases because her fighting skills and knowledge are sharper due to her lifelong training. His “problem” is that he fears to push her so far into the darkness inside her that neither he nor anyone else can pull her out of it again. Sabine, of course, needs a wake-up call here as well. Ezra has to point out to her that she’s being stubborn; no one on the Ghost believes she is a coward or that she cannot handle herself. They have seen her in action and relied on her to watch their backs in battle. They know she is brave, honorable, and a true daughter of Mandalore. What she has to do is stop thinking no one believes in her, while also acknowledging the fact that she’s lucky she has a real blood family left. Hera’s mother is dead, Kanan lost his Master and the entire Jedi Order, Zeb lost Lasan, and Ezra’s parents were murdered by the Empire. Considering all the pain and suffering she sees around her, she should be happy she has any family left – whether they believe in and love her or not. Recognizing that Ezra is right, Sabine goes back to apologize to Kanan for her earlier behavior. When she does, he hands her the Darksaber, proving he is ready to do what he has to do to help her heal. An emotionally charged duel follows. Instead of supporting Sabine the way he normally does, Kanan hardens his attitude toward her, using the barbs he does not even throw at Ezra on her. To emphasize the taunts, he easily ducks and dodges her wider swings despite his blindness, tossing in some pointed shoves for good measure. If Sabine wants him to prove he believes in her, he is going to do it – by acting like he doesn’t. Of course, all of this nearly does push Sabine over the edge. This is the same kind of treatment she got from her family. These are the same jibes and snide comments she hears in her head when she thinks back to her escape from Mandalore. These are the same lies she has had to live with for five years on a repeating circuit in her head. And they are coming out of the mouth of someone she trusts and loves. Naturally, she blows up; flying at Kanan in fury as the pain, anger, and doubt she has held inside for so long finally bursts out of her. But before she completely loses herself to blind fury, Sabine stops. Some part of her recognizes that Kanan has purposefully given voice to the self-doubts which plague her for a reason. That, I think, is why she halted when she did. With her anger and pain released the doubts fall silent, and she is no longer standing over an enemy. She is standing over the man who had to hurt her so she could let go of a past she was holding on to in order to avoid, essentially, growing up and letting go. The man who has, she now realizes, never done this to her before – and who did not want to do it to her – because he loves and believes in her as if she were his actual daughter. This is why Kanan can tell Ursa Wren she cannot see the woman Sabine has become. Like all mothers, Usra still sees her daughter as the baby she held in her arms, the toddler she took out for walks, and the child she had to protect with all the fierceness of the bear for which she is named. In part, she does not see Sabine’s maturity because she has missed five years of her daughter’s life. However, the main reason she does not recognize this fact is because she still looks at Sabine and sees her little girl, not a grown woman. Kanan has watched Sabine grow over the years she has been away from her family. He has been her support – her surrogate father – since she left home. And even though he is blind, he saw Sabine change from a broken, haunted girl into a true woman and warrior in the space of a moment back in “Trials.” Ursa does not have that perspective until the end of “Legacy,” when she watches Sabine take on and defeat Gar Saxon in combat before honorably refusing to murder him even when he declares he will not yield to her. This all adds up to make Sabine Wren one of the best characters in the new Star Wars timeline. It is also the reason why she is my third favorite character from the Rebels’ crew. I think she is a good addition to the Star Wars canon and that she would have fit nicely into the old EU. I rather wish we could have had her meet and befriend such original characters as Mara Jade, Mirax Terrik, and Iella Wessiri Antilles (what a girls’ night out that would have been!). Even so, I am glad to have “met” Sabine Wren. She is a heroine worthy of admiration and respect – a rare find in today’s fiction market. Well, readers, that is all I have to say for now. Until next time, may the Force be with you! This entry was posted in Star Wars Characters and Stories, TV Shows and tagged Black Widow/Natasha Romanoff, Captain America: The Winter Soldier, children's animated tv shows, Chopper, Disney Star Wars, Disney TV Shows, Ezra Bridger, Freddie Prinze Jr., Garazeb Orrelios, Hera Syndulla, Iella Wessiri Antilles, Kanan Jarrus, Mandalore, Mandalorians, Mara Jade, Mara Jade Skywalker, Mirax Terrik, Sabine Wren, Star Wars, Star Wars Characters and Stories, Star Wars Episode IV: A New Hope, Star Wars Rebels, Steve Blum, Taylor Gray, Tiya Sircar, TV Shows, Vanessa Marshall, Zeb on May 4, 2018 by The Mithril Guardian. Okay, first things first. I have not seen the last six episodes of season four of Star Wars Rebels and, judging by the descriptions, I don’t think I want to see them – not any time soon, at least. I know I am a minority opinion in this regard, and if my decision upsets you, I am sorry for hurting your feelings. But we’re not responsible for the choices of others; my decision is my own, so don’t feel bad if you think I’m wrong. That is your decision, and I certainly don’t feel bad about it. Neither should you. All right, let’s review some of the episodes I did see. I mostly enjoyed Heroes of Mandalore, with just a couple of minor points of reserve/annoyance. One, I would have preferred to see Alrich Wren in Mandalorian armor rather than normal attire. He is a Mandalorian, for Pete’s sake; dress him like one! He can be less severe than Ursa Wren all day long, but that doesn’t mean you have to make him look like a wimp. Two, if Ezra could have actually been there to watch Sabine decide to destroy the Duchess rather than show up and beg not to be shot, I would have been happier. This was the biggest sticking point for me in these otherwise excellent episodes. Seriously, what is so bad about letting the guy help the girl? Could someone please explain this to me? You could have had Ezra show up and deal with Tiber Saxon’s backup while Sabine fixed the Duchess to zap Stormtrooper armor instead of Mandalorian armor, couldn’t you? Then Ezra could help Bo-Katan turn Sabine from a desire for revenge to choosing to do what was right. He’s a Jedi, and he’s been where she is, and so I would think that would add some weight to his advice. Next we had “In the Name of the Rebellion.” Now these episodes were more aggravating for me than the others, and that had less to do with the characters than it did with the way the Rebellion leadership behaved. In the original EU and film trilogy, the Rebellion was about doing, not talking. Whose bright idea was it to make the Rebel leadership so spineless in the new timeline, anyway? When we were originally introduced to Star Wars, the Rebellion was well past this political whining – if it had ever really had to deal with it. Watching them dither about committing troops to a fight or leaving their own bases absolutely grinds my gears. That said, I agree that Saw Gerrera’s tactics are over the top and wrong. And I do agree with the writers’ decision to hammer this point home to Ezra and Sabine. Hitting the enemy hard does not mean you put innocent people in danger, which Saw was doing, and they needed to learn that truth. However, Saw also had a valid point which the writers didn’t really do anything to explain; if you fight according to the enemy’s rules, you will lose. Because guess what, they are the enemy’s rules, and that means the enemy can change them any time they want. If you let the enemy do this to you, you won’t be able to adapt to the changes fast enough to survive, let alone win the fight. When you are fighting for freedom from tyranny, fight to win, dang it! Otherwise, get out of the way and let everyone else do their job. As you can tell, this plot point really got under my skin, but there were things to enjoy here. Watching Kanan help Hera fly blind was great, and seeing a huge khyber crystal was very interesting. I also liked that these shows gave us a glimpse of the scientists the Imperials were using to make the Death Star. We rarely got to see prisoners being rescued by the Rebels in this series, so it was nice watching Ezra and Sabine work out how to destroy the crystal while protecting the prisoners at the same time. The rest of the episodes were fun and artfully done, from the return to Lothal to the mission to make contact with the Rebellion. I had a few points of disagreement with the writers along the way, though. Watching the Rebellion leadership wimping out again was seriously aggravating, as was the lack of Kallus’ presence in these shows when he had promised to have such an interesting part in this season. The general trend in “girrrrrl power” at the expense of the guys’ characters and masculinity was another demerit for this season, too. But I would have to say that “Rebel Assault” was the show I had the biggest problems with, and not just because of the warning about Kanan’s impending demise. No, my biggest problems here were how the Rebellion decided to handle this attack and how the writers showed Hera fighting Rukh. First, we will deal with the Rebellion. In “Rebel Assault,” the mission is supposed to be an attack on what is, in essence, a war factory. But somehow Mon Mothma, Bail Organa, General Dodonna, and the rest send nothing more than a couple of measly fighter squadrons to destroy it. What the Sam Hill….? That makes no sense, even when you consider that Thrawn is the one directing the Empire’s defense. When we sent fighter planes over Germany and Japan, they weren’t carrying the bombs we dropped, the bombers were. Y-wings certainly have the capability to drop bombs, but they’re still, technically, fighters. Hera should have had at least a few corvettes and blockade runners backing her squadrons up on this mission, but that didn’t happen. This mistake on the part of the writers immediately pulled me out of the story when I watched the trailers and led me to the conclusion that Hera’s attack was doomed to failure. No commander in their right mind, for a mission like this, would send in just fighters. The Death Star was so darn big that it had to be attacked by little bitty fighters, which it couldn’t swat as easily as it could have obliterated a bigger ship. But in this battle, the Rebels were up against Star Destroyers. Yes, Star Destroyers are big, powerful, and scary. Unlike the Death Star, however, they can be challenged by ships of equivalent or smaller size with relative success. Dodonna would certainly have known this, and I would think Mon Mothma and Bail Organa would know it, too. The fact that the writers did not send a support force with Hera’s squadrons shows me that they either weren’t thinking, they don’t have even a glancing knowledge of military history, or they were under pressure from their superiors. My money is on the latter, to be honest; these writers have shown a level of skill which makes it hard for me to believe they aren’t clever enough to think of these things or don’t know at least a bit about history. I can’t believe (not right now, anyway) that they would do this out of simple ignorance and thoughtlessness. They’re too smart for that answer to fly. Now we come to Hera’s hand-to-hand battle with Rukh. I am sorry, Hera fans, but I had a major problem with this. In this episode, Hera crash lands in the capitol city of Lothal after her failed attack. Obviously, she has to escape back to camp so the Empire can’t interrogate and kill her. The main difficulty with this plan is that she faces a Noghri hunter – Star Wars’ version of a super ninja – who has been sent to bring her in for interrogation. Yet after crashing and being injured, she still manages to handle Rukh perfectly in close combat, despite having a headache and an injured arm. Sorry for the blurriness of this shot. Leave aside for a moment the fact that the Noghri are invisible to Force-sensitives (they can’t sense them through the Force at all) and that they are good enough at combat to scare competent Jedi like Luke Skywalker, Leia Organa Solo, and Mara Jade. Leave aside as well the fact that Wookiees, impressive, massive warriors that they are, cannot bring down a squad of Noghri without suffering serious wounds and severe losses. Bottom line, Hera’s injuries should have been limiting factors in her fights with Rukh. She should have tried harder to avoid hand-to-hand combat with him because of her weakened state. A Noghri’s size is extremely deceptive; they are strong enough to go hand-to-hand with full-grown Wookiees and match them in physical power. The fact that Hera can somehow, with a bum arm and a headache, throw and hold Rukh so easily shouldn’t be possible in-universe. And yet the writers had a wounded Hera Syndulla rather easily hold her own in battle with an alien whose people are veritable super ninjas, beating out the Jedi, Mandalorians, and Mistryl Shadow Guards in terms of skill and prowess. (Author glances from side to side.) Am I the only one who sees a problem here? I like Hera – even though she is not my favorite character – but come on. Am I the only one who looked at this fight and went, “Agh, here we go with the girrrl power motif again”? Yes, part of the reason I do not wish to see the last six episodes of Rebels is because Kanan dies. I had a feeling it was coming, and I knew it was going to be especially upsetting for me personally. HOWEVER; this is not the first time I have seen a major character I liked die, so it is not simply the fact that Kanan croaks which makes me desire to avoid these installments in the series. In fact, when I think of where he died, I dissolve into giggles. Now you are thinking I am some kind of heartless maniac, right? I don’t want to giggle over this – seriously, the guy was my favorite character! I spent lots of pixels talking about and praising him. But every time I think of him standing on a fuel tank when it goes up, I just start giggling. There’s something kind of – I don’t know, anti-climactic in picturing someone being blown up while standing on top of a fuel tank. I guess it makes me think of all the bad guys I’ve seen/wished to see blasted off into kingdom come by a big explosion, or all those idiotic side characters who choose to stand in the wrong place at the wrong time and get blown up. There’s also the whole “blow-up-the-fuel-to-save-the-environment-while-standing-on-the-fuel-tank” angle to consider. It’s just – it strikes me as a rather comical place to die. And yes, I am giggling while I write this. Now if I had seen Kanan die, I probably wouldn’t be so cavalier about this scene. It sounds like a tear-jerker, which is another reason I want to avoid it right now. None of my friends need me breaking down on them when we’re supposed to be relaxing in front of the TV, after all. And if I watched it alone, I would be stuck dealing with me sniffling. That is not nearly as much fun as the movies make it look, readers. 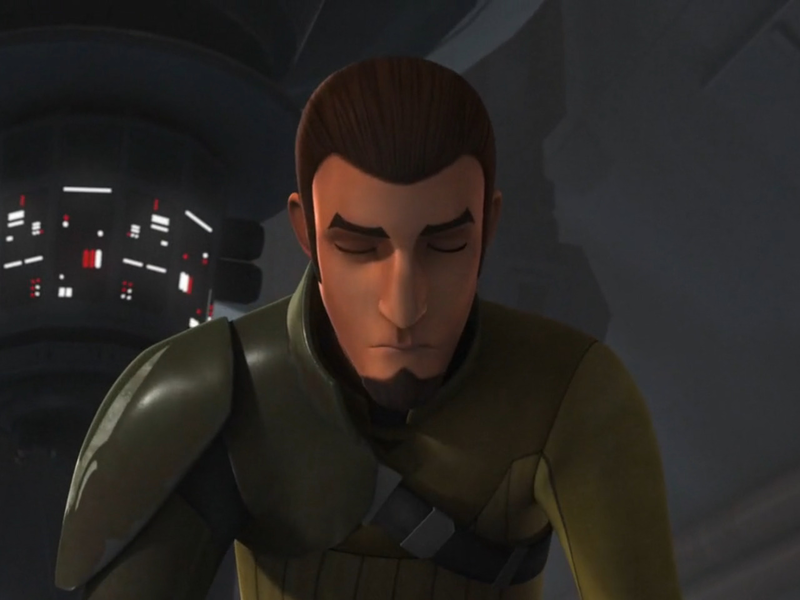 But the bigger reason is that I think that, if Rebels had been allowed to last longer, Kanan need not have died at all. We’ll delve into this a little more below, but does anyone else feel like the last six episodes were a bit rushed? It is as though someone told Filoni and the gang, “Season four is your last; kill the show. We don’t care how you do it – so long as you don’t kill the girls – but end this thing before 2019.” The last six episodes are jam packed, proceeding at a near breakneck pace I can sense just from the descriptions. There’s barely a pause for breath in each one. Based on what I have read about these final installments, I think Filoni knew when he started this series that the higher ups at Disney/Lucasfilm wouldn’t like it due to their political leanings. He’s thrown some political bones into the mixture from time to time over the past three seasons, but on the whole, I would say he was telling a good story well here. There is nothing more aggravating to the “artísts” who insist that every piece of fiction should be a vehicle for one agenda or another. He knew he was on borrowed time, more or less, and that giving Kanan and Ezra their fair shakes would probably cost him in the end. So when they told him to kill Rebels, he said, “Okay, but can I kill it my way?” They of course said yes, thinking he was being a good little drone doing what they wanted him to do. Personally, though, I believe he blew up Rebels rather than let them get their hands on it. This brings us to my next big problem with how the series ended…. When I read the description for “A World Between Worlds,” I handled it pretty well at first. But thinking back over it, I began to get more and more uncomfortable. Even in the old EU, I was not happy with the writers’ decision to add time-travel to the Star Wars universe. Star Wars, like The Lord of the Rings and other fantasy stories, has a fixed timeline. You may be able to view the past in some way in Star Wars through the Force, but the idea of sending people backward and forward through time in the mythos never sat well with me. This is why I didn’t like the old EU’s penchant for messing with time-travel. The reason I don’t like it in Rebels is that it completely negates the ending of season two of the series. In essence, it saves Ahsoka by cheating; sending Ezra back in time to save her instead of letting the Force protect her in some more spiritual/physical manner, knocks everything in Twilight of the Apprentice into a cocked hat. Now if the “World Between Worlds” had been more like the “Wood between the Worlds” in Narnia, where the spiritual and physical planes sort of “meet” each other more completely than they do anywhere else, I would have been happier. In a case such as this, I would think the writers could have had Ahsoka escape to the “World Between Worlds” from Malachor either on her own or with the help of the Force. While a year or so passed outside the Lothal temple, for her, minutes would have elapsed between her arrival there and Ezra’s journey inside. Because Ahsoka was here, and because this was a place where the physical plane and the Force sort of “touched” each other moreso than they otherwise do, the writers could have had the Emperor chasing the two down in an effort to convert/kill them and take over the place. Then, because this area intersected with the spiritual realm, the writers could have had Kanan’s spirit appear to help the two escape/thwart Palpatine. Though not trained like Qui-Gon, Obi-Wan, and Yoda in keeping his form when he became one with the Force, I don’t think Kanan would have needed such training to appear in a place where the Force and the physical plane meet. Writing the story this way would also have allowed him a chance to say good-bye to Ezra while still giving him his “last lesson” as a Jedi. To me, this would not have been nearly so much of a cheat as the story we did receive in “A World Between Worlds” was. I have two problems with this battle, and the first is the idea that the Empire left Lothal alone after the remaining members of the Ghost crew blew up all the Imperials on the planet. The idea that, one year out from the completion of the first Death Star and roughly five years before Endor, Rebels could throw the Empire off of a planet as valuable as Lothal and that planet would remain free until the final battle of Return of the Jedi is completely illogical. Anyone who knows anything about history can tell you this. For example, the Battle of Trenton did not free the United States from British tyranny, nor did it keep the British from coming back to Trenton. It took eight long years for us to boot them from our soil and guarantee the safety of all our citizens’ from English attack/retribution. Likewise, the Rising of the Vendee against the revolutionaries who wrought such barbaric terror on France did not free their country. In fact, most of the Vendee fighters were slaughtered by the revolutionaries running the French Republic. The Cristeros in Mexico had it little better, which you will see if you watch the film For Greater Glory. Though the Mexican president was eventually forced to stop fighting them, the Cristeros were still being killed many years after the end of the Cristero War. The people of Zaragoza, a city in Spain, rose up against Napoleon’s army after he conquered their country and threw the best troops in the world out of their city. Months to a year later, however, the Zaragozans were defeated by the vengeful French and the few remaining inhabitants were marched out of a city that was in ruins. The same thing happened to the Tyrolese – twice – when they fought Napoleon’s forces in an attempt to rejoin Austria after he had annexed their district from their mother nation. My point in bringing up these examples is that you do not bloody a tyrant’s nose and get off scot free, readers. You have to keep fighting until the tyrant is six feet under, no longer on your country’s soil, or you are dead. And at this point in the mythos, Palpatine is still alive. Even considering the destruction of the first Death Star, he should have had forces committed to Lothal to at least wreak his vengeance on that world. The war was touch-and-go from A New Hope up to the moment Luke decided not to kill his father on the second Death Star. Like the rest of the galaxy, Lothal should only have been freed by the Battle of Endor, when Palpatine was killed. The fact that the writers didn’t do this is absolutely mind-boggling to me. It also helps convince me of the theory I mentioned before; the people above Filoni must have told him to kill Rebels but to make it “a happy ending.” So he gave them what they wanted, but not what would actually work, ala blowing up the story rather than letting them get their hands on it. I could be wrong of course, but that is why you are reading this as an opinion rather than as a stated fact. With regards to the splitting of the “space family” at the end of the show, it doesn’t sit particularly well with me, either. The whole point of the series seemed to be centered on this family holding together throughout the Rebellion. In keeping with that premise, I would have thought the writers would have kept the whole crew on or around Lothal for most of the Rebellion, until Endor put everything to rights (hence my belief that Rebels was killed early by the people running Disney/Lucasfilm). If the writers had gone this route, it would have prevented the Ghost crew from running into Luke and the gang during the films, while not derailing Yoda’s line about Luke being the last of the Jedi. If Kanan was busy splitting his time between Rebel work and being a father, I don’t think Yoda would consider him much of a Jedi. The same would go for Ezra; with such an unorthodox teacher (and maybe a girlfriend of his own at that point), Yoda wouldn’t have thought of him as much of a Jedi in such a case. And that brings me to my earlier point about Kanan not needing to die if the series had lasted longer. Even keeping his death in the story, the rest of this ending is too compressed and illogical to stand the way it is. This means that I think that if I tried watching these last two episodes alone, my head would explode from the sheer absurdity of the ending. It has to be the result, to my mind, of interference from the people running Disney/Lucasfilm. Filoni is too smart, from what I have seen, to do something like this and expect people to buy it. In conclusion, I have to admit that the ending for Rebels has been a severe disappointment for me. But that is only in the ending. The first three seasons I will happily re-watch for many more years to come. I’ll probably watch season four’s first nine episodes again, too. And who knows? Maybe I will watch the last six shows at some future date. For the time being, however, I am content not to watch them, due to the reasons listed above. Call me a coward or stupid or whatever you like, readers, but the fact is that, to me, these last six episodes are a non-ending. In my opinion they do not do justice to their characters, their story, or their audience. And right now I really, really do not need to deal with any of that. This entry was posted in Star Wars Characters and Stories and tagged Ahsoka Tano, Alrich Wren, American Revolution, American Revolutionary War, American War for Indepence, Ashley Eckstein, Bo-Katan, C. S. Lewis, Chopper, Cristero War, Dark Side, Dave Filoni, Death Star, Disney, Disney Star Wars, Disney TV Shows, Disney XD, Disney/Lucasfilm, Emperor Palpatine, Endor, Ezra Bridger, France, Freddie Prinze Jr., Garazeb Orrelios, Hera Syndulla, Jedi, Kanan Jarrus, lightsabers, Luke Skywalker, Mandalore, Mandalorians, Mara Jade, Mara Jade Skywalker, Mistryl Shadow Guards, Narnia, ninjas, Princess Leia Organa Solo, Rising of the Vendee, Rukh, Sabine Wren, Sith, Star Wars, Star Wars Characters and Stories, Star Wars Rebels, Steve Blum, Stormtroopers, Taylor Gray, The Chronicles of Narnia, The Dark Side, The Force, The Ghost, The Magician's Nephew, The Noghri, Thrawn, time travel, Tiya Sircar, Trenton, Twilight of the Apprentice, Ursa Wren, Vanessa Marshall, Wookiees, Yoda, Zaragoza, Zeb on April 4, 2018 by The Mithril Guardian. Yes, I know this is a terrible title for a post. It was the best that I could come up with, however, so we are all stuck with it. At the end of my post “Tribute to the Jedi,” I listed three of my favorite lightsaber duels in Star Wars Rebels. Discussing these battles with a friend some time ago, I recalled one I had forgotten, which will be mentioned below. During our chat I admitted something which still stands out to me in each of these encounters between the Jedi and the Dark Siders. As we go through them, I will make certain to mention what this recurring theme is. Before we do that, though, I have something to admit: I do not like the new Star Wars timeline, especially the books. It does not jive with the original films, preaching rather than telling a story. Having read several novels in the original Star Wars Expanded Universe, along with a number of books in the new timeline, I find that the older ones (usually) fit better with the original trilogy than the new ones do. I have said that the era of the original trilogy – the time of the Rebellion, for want of a better layman’s term – is my favorite in the Star Wars universe. My enjoyment of this period of the story explains why I gave Rebels a chance. I love learning about Jedi who lived through the Purge, especially if they played a part later on in Luke Skywalker’s New Jedi Order. Perhaps it was their surviving adversity for twenty years, or maybe it was just watching the transition to the Rebellion era. I don’t know how to explain it, or if I can, but anything that involves Jedi from the Old Order surviving to see the rise of the New just thrills and intrigues me. So I wanted to know more about Kanan Jarrus before the series even began. I got excruciatingly little there for the first few episodes, which drove me half crazy and made every Jedi-centered episode a treasure. More than once I would leave the television feeling disappointed with an episode because it had not delivered the desired Jedi-fix. “Fire Across the Galaxy” satisfied my wish for more Jedi stories with the amazing lightsaber duel at its climax. It is a spectacular fight that begins with Ezra helping Kanan – who has been undergoing Imperial “interrogation” – escape Grand Moff Tarkin’s Star Destroyer. For some reason I still do not understand, they decided to cut through the engine room to get to a fighter bay and freedom. Naturally, the Grand Inquisitor is waiting for them there. 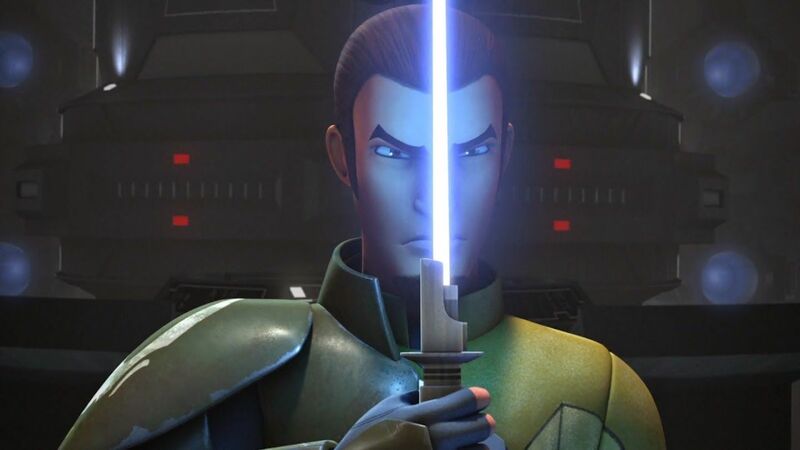 Despite not being in top shape, Kanan takes his apprentice’s nifty lightsaber and goes after the Inquisitor. The battle becomes two-on-one when Ezra retrieves his Master’s blade from the Pau’aun’s belt and activates it. But at this point, Ezra’s still not good enough at blade work to defend against the attacks of the more experienced Dark Sider. He tries Kanan’s baseball bat trick to deflect the Inquisitor’s thrown blade – and it works, in so far as the boy does not get cut in half. However, the spinning hilt does scratch his face, and it has enough momentum behind it that Ezra loses his balance and falls to another catwalk. This is what Kanan has been afraid of from episode one of the season; that he will fail and Ezra will be killed. He already holds himself responsible, to some degree, for his own Master’s death; losing Ezra would be like going through that pain all over again. Only this time it would be worse because Kanan is not a kid. He is an adult who should be able to protect his apprentice as well as train him. Sent sprawling by a Force push from the Inquisitor, not to mention still dealing with the aftereffects of the Empire’s torture, Kanan is not able to get up in time to prevent Ezra from tumbling to his apparent death. He ends up on his knees, looking down at the boy, whom he doesn’t realize is just unconscious. What got me about the scene wasn’t simply the grief we see on Kanan’s face when he thinks Ezra is dead. That was to be expected. No, it is how his expression changes after this. Before he stands up, the grief and anger leaves Kanan’s face, to be replaced by calm acceptance. This is important because, in this moment, Kanan stops fighting the Force and lets it come to him. He is still sad, he still believes Ezra is dead, and he is none too happy with the Grand Inquisitor. You can hear all those emotions in his voice when he addresses the Dark Sider in the next frame. The rest of their duel is a beautiful thing to watch, but this particular part is my favorite scene. As we see later on, Ezra is right to say that Kanan is “better than okay.” Here he is, actually, better than okay. Allow me to explain. Kanan’s entire struggle up to this point has been with his fear of discovery. He has also been afraid to accept his Jedi heritage and to return to the Jedi path. The only times he is really able to pull off feats of strength using the Force is when something frightens him more than this. We see it in “Rise of the Old Masters,” when he throws the Inquisitor into the ceiling to save Ezra, and earlier in the same episode when he reaches out with the Force to keep the boy from falling to his death during a lesson. Each time, Kanan has to strain to use the Force. This is both because he is out of practice and because he has two fears vying for his attention at the same time: fear of failing Ezra and fear of being discovered. But in this duel, he finally lets the fear go. And that allows the Force to enter him at last, making him a willing vessel for its designs. This is why he does an apparently inexplicable one-eighty degree turn in his skill level during the duel. While he still needs to practice his sword work the fact is that, here, Kanan is no longer alone. He is finally – finally – letting the Force guide him and act through him. Whoa, not so fast there, Speed Reader! Let’s take a look at my second favorite battle on this list…. I have never seen more than a few clips of The Clone Wars. The poor direction of the prequel movies left such a bad taste in my brain that I could not stand the cartoons. And yeah, I was naïve enough at the time to think the series did not tie into the larger Star Wars universe. Well, I eventually found out that Clone Wars WAS part of the Star Wars timeline even before the new trilogy arrived. This meant, naturally, that I needed to learn more about it. As I was digging through the archives about the series I stumbled on Ahsoka Tano’s file. Everything I read about her made her sound interesting, to the point that when I pictured her being killed by Anakin Skywalker in Revenge of the Sith, I wished she didn’t have to die. I had not even seen her yet, readers, but I already thought she was a great character! So I was relieved to learn she left the Jedi Order before the Purge. That at least put off a confrontation between her and Vader, hopefully permanently. I really wanted her to survive to meet Luke after Return of the Jedi so we could watch her connect with her master’s son. Learning that this amazing character would be reappearing in Rebels was very exciting. I would finally get to meet the famous Ahsoka Tano and see if she was everything I expected her to be. 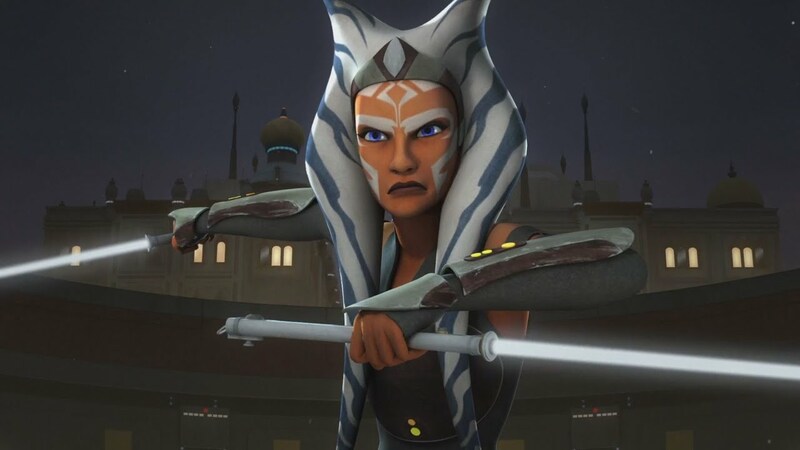 Her fans will not be surprised when I say she did not disappoint; I still do not like The Clone Wars, but I am definitely a fan of Ahsoka Tano…. …So I was rather irritated when she did not get to use her lightsabers immediately upon her appearance in season two of the show. We had to wait until “The Future of the Force” to see her draw her new white blades, let alone use them. But it was worth the wait. Watching Ahsoka hand Fifth Brother and Seventh Sister their fannies on a platter was amazing. She eventually managed to throw Fifth Brother into a column, briefly sending him to dreamland, before focusing entirely on Seventh Sister. I will never forget what she did next because it was so unexpected. Instead of pressing her advantage with the remaining Inquisitor, Ahsoka shut down her blades. Then she put them away, knelt down on the ground, and held her open hands up to the air. Of course, Seventh Sister thought Ahsoka was an easy target. But without even opening her eyes, Ahsoka caught the other woman’s lightsaber hilt between her hands and, using the Force, shut the blade down before tossing it aside. “Shroud of Darkness” was such a powerful episode that I did a post about it almost two days after it aired. Most of that article revolves around the shocker of who the Sentinel Jedi was, along with theories about how he got to the Lothal temple and the Light Side. As lightsaber duels go, this one didn’t really stick in my mind the way the previous two did. Except for one scene, that is. This scene comes when Kanan has been knocked down by the Sentinel Jedi. Two others have come to back the lead Sentinel up, and the Lothal temple has begun to collapse as Fifth Brother and Seventh Sister force their way inside. Kanan is once again on his knees. But here he is also surrounded and running out of time. Since I knew this was a vision, I knew that Kanan could not truly be hurt here. So when the Sentinel raised his lightsaber, I was pretty sure Kanan was not going to die. I didn’t know he would be knighted, but I knew he would not be killed. Again, though, in this scene Kanan is on his knees. He has been forced there by the fight, and because of time constraints, he does not try to stand up. He stays kneeling, fully expecting to be struck down. What is the significance of this? Why, other than the fact that he is officially knighted in the next moment, is Kanan again on his knees here? Let’s look at the last battle on my list to find the answer to that question. If there is one character in the Star Wars universe I despise completely, I would have to say it was Maul. Ever since I saw him in The Phantom Menace, I have hated him. Why Lucas made him and his species is beyond me. For some reason, I thought we were done with this Zabrak even before the new timeline was announced. No such luck; Maul returned to plague us again in “Twilight of the Apprentice,” managing to hook Ezra with the lure of the Dark Side in the process. For a while he played he was on our guys’ side, but we all knew that he was tagging along for the ride. He wanted something, and he needed Ezra to get it. So while it was not a surprise when he attacked Kanan, I was not expecting him to blind my favorite Rebel Jedi. Ahsoka went up about twenty more bars in my estimation for jumping in automatically to protect him, but it was still nerve-wracking to watch Kanan, on his knees once more, searching for his lightsaber. Seeing him best Maul in three short moves – perhaps a nod to the former Sith Lord’s later defeat by Kenobi – did not exactly ease my fears, but it certainly proved Kanan could still fight (and how!). The main point, however, is – you guessed it – the fact that Kanan landed up on his knees again. By now you are furious at me for taking so long to get to this point. “Just what is it about Kanan and Ahsoka kneeling down or ending up on their knees in all these battles that has you so interested, Mithril?” you are snarling at the screen. Well, we all know that Lucas borrowed elements of Christianity for his fantastic galaxy far, far away. When watching the Star Wars films or reading the books, the Christian aspects of the stories have always stood out to me – especially in Zahn’s novels about Star Wars (this is another reason why he is my preferred writer in the original EU). Thus the small, seemingly inconsequential moments when the Jedi kneel down during these duels has far more meaning than most of us suspect at first viewing. Interpreted through the lens of faith, we can see a heartening message in these “pivot points” where the Light Siders put their faith in the Force to help them win the fight. Does that mean the writers and Dave Filoni put these moments here on purpose? Perhaps they did. I do not know any of them, so I cannot say. And if they want to keep their jobs, then I do not think they can come out and admit that they even have faith of any kind. It is something of a taboo subject in the circles where they work these days (just look at how Marvel Comics’ roster of writers treats the subject). In the end, though, it does not matter whether these moments are messages from Christian writers to Christian viewers. What matters is these scenes are present for an astute Christian to see, which is why I bring them up here and now. One of the reasons I started Thoughts on the Edge of Forever is because I believe God talks to us through the fiction we enjoy. Over the years I have come to see His Hand in more than one of my favorite stories. Sometimes it is easy to know when He is there, as it is in the Chronicles of Narnia. But in other stories – like Tolkien’s Middle-Earth, Star Wars, Star Trek, and a multitude of different fictional universes – He takes us by surprise. This was the case with me when I went to see Marvel’s The Avengers. I had caught glimpses of Him in my research into the comics, but I really saw and heard Him in that movie. Obviously, this is why I have taken such issue with Marvel Comics’ current course, not to mention attacked other franchises when they “play politics.” As Dean Koontz pointed out in his novel Ashley Bell, good fiction can heal souls. It can do this because, through the veil of the fantastic, God touches our lives and raises our minds to Him. So when authors and/or their employers begin to drag the focus of the story toward “representation for all,” “women’s rights,” “equality for everyone,” or they try to make their fiction “realistic,” they chase God out of their fantastic universes. And a story without God in it, no matter how artistically done or how much time, effort, and money are lavished on it, fails to become a story at all. Why? Because God made stories, too, readers. He made our very lives, and what are they but stories? He doesn’t make our choices for us, or push us to do things His way. Rather, as Star Wars Rebels: The Rebellion Begins puts it, He weaves a pattern through the universe. We are free to act in accord with that invisible web, to run away from it, or even to attack it. God doesn’t force us to take any one of these three courses, but it is His right as the Creator of the cosmos to fit them into the pattern He is weaving. Whatever we choose, we are free to choose it, as He is free to undo it or make it better. That, at its core, is the basis of Star Wars. Filoni and his crew – along with Zahn and other authors for the “old EU” – understand this very well, at least on an instinctive level. But many of the new authors for the franchise, either because they are blind to the Truth or because they fear the Emperors of this galaxy, are letting this understanding go. This is poisoning their new stories in the process and, while it does not mean the whole new timeline is worthless, it does make it inferior to the original in most cases. While some will think this is reason for despair, I ask you to remain hopeful, readers. After all, God can turn even great sorrow to joy. He may have some great good planned which will upend the schemes of the Saurons, Sarumans, Gollums, Emperors, Inquisitors, and Mauls tearing apart story land – and Star Wars – today. In which case, it is best we imitate Kanan and Ahsoka, metaphorically speaking, and open ourselves to listen to what He has to tell us. “For even the very wise cannot see all ends” – and when they try, they stop being wise. It is better, oftentimes, to wait and listen. He’ll tell us when the time is right to act. He always does. May the Force be with you, readers, always. This entry was posted in Star Wars Characters and Stories, TV Shows and tagged Ahsoka Tano, Ashley Bell, Ashley Eckstein, Chopper, Dark Jedi, Dark Side, Darth Maul, Dave Filoni, Dean Koontz, Disney Star Wars, Disney TV Shows, Disney XD, Disney/Lucasfilm, Ezra Bridger, Freddie Prinze Jr., Garazeb Orrelios, God, Hera Syndulla, Jason Isaacs, Jedi, Kanan Jarrus, lightsaber duels, lightsabers, Maul, Sabine Wren, Sentinel Jedi, Sith, Star Wars, Star Wars Characters and Stories, Star Wars Episode IV: A New Hope, Star Wars Episode V: The Empire Strikes Back, Star Wars Episode VI: Return of the Jedi, Star Wars Episode VII: The Force Awakens, Star Wars Episode VIII: The Last Jedi, Star Wars Rebels, Star Wars trilogy, Star Wars: The Clone Wars, Steve Blum, Taylor Gray, Tiya Sircar, TV, TV Shows, Vanessa Marshall, Zeb on January 7, 2018 by The Mithril Guardian. It is funny. When I first heard about Rebels, I thought I would not like it. The Star Wars prequel films are among my least favorite films, and so I avoided the animated Clone Wars series. Part of me believed Rebels would follow in that vein, but another part – the part which has always wanted more stories about Jedi who survived the Purge and/or the Jedi that emerged during the Rebellion – had some faint hope that Rebels would be worthwhile. Turns out, the hopeful side of me was more right than I guessed. I fell in love with Rebels and wanted to see it fill in the gaps between the original trilogy films, bringing in “Legacy” characters whom Disney/Lucasfilm decided weren’t worth keeping. The announcement that season four would be the series’ last knocked that hope off the table, though, and I am going to miss this series a lot. So far, my favorite lightsaber duels are: 1) Kanan vs. The Grand Inquisitor aboard Tarkin’s Star Destroyer; (2) Ahsoka defeating Fifth Brother and Seventh Sister on Garel, and (3) Kanan beating Maul after he’s been blinded by the former Sith Lord. Which lightsaber duel from the series is your favorite? Feel free to let me know in the comments, and may the Force be with you! This entry was posted in Star Wars Characters and Stories and tagged Agent Kallus, Chopper, Cowboy Jedi, Dark Side, Dave Filoni, Disney Star Wars, Ezra Bridger, Freddie Prinze Jr., Garazeb Orrelios, Hera Syndulla, Jason Isaacs, Jedi, Jedi Order, Jedi Purge, Kanan Jarrus, lightsaber duels, lightsabers, Mandalore, rebels, Sabine Wren, Star Wars, Star Wars Characters and Stories, Star Wars Episode IV: A New Hope, Star Wars Episode V: The Empire Strikes Back, Star Wars Episode VI: Return of the Jedi, Star Wars Episode VII: The Force Awakens, Star Wars Episode VIII: The Last Jedi, Star Wars Rebels, Star Wars: A New Dawn, Star Wars: Attack of the Clones, Steven Blum, Taylor Gray, The Force, Tiya Sircar, Vanessa Marshall, Zeb on November 14, 2017 by The Mithril Guardian. 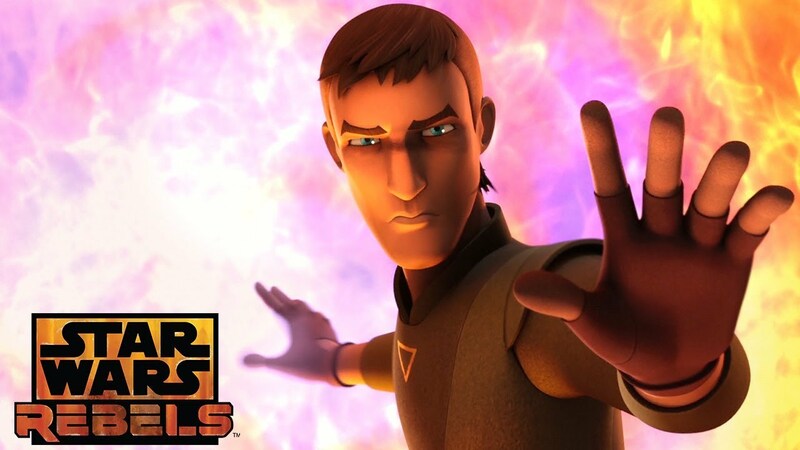 Star Wars Rebels – They Came That Close! Have a gander at this scene from “The Occupation,” the next episode of Star Wars Rebels to air this coming Monday. I was never sure what to make of the Kanan/Hera romance, so this near-kiss was surprisingly sweet. On top of that, glancing through the comments below the clip was almost as much fun. While a couple of remarks really weren’t that funny or likable, seeing the number of people moaning at the person who ruined the moment was. Of course, yours truly couldn’t let them have all the fun on youtube. That just wouldn’t be sporting. 😉 Enjoy the clip, and remember that you can catch more episodes of Star Wars Rebels‘ final season on Disney XD, readers! This entry was posted in Star Wars Characters and Stories, TV Shows and tagged children's animated tv shows, Chopper, Dark Side, Disney Star Wars, Disney TV Shows, Disney XD, Ezra Bridger, Freddie Prinze Jr., Garazeb Orrelios, Hera Syndulla, Jedi, Kanan Jarrus, love story, Sabine Wren, Sith, Star Wars, Star Wars Characters and Stories, Star Wars Rebels, Steve Blum, Stormtroopers, Taylor Gray, The Dark Side, The Force, The Ghost, The Occupation, Tiya Sircar, TV Shows, Vanessa Marshall, Zeb on October 27, 2017 by The Mithril Guardian. Star Wars Rebels’ Trailer 2 for Season Four Is OUT!! I missed this trailer when it came out, so this post is probably coming out a day late and a dollar short. But better late than never, right? Okay, first things first. Turns out, that wolf we saw in the first trailer is a Loth-wolf. And it is part of a pack – a big one! Ruhk, the Noghri bodyguard for Grand Admiral Thrawn, is now a canon character, readers. Thrawn wants him to take out Hera, and despite the Noghri race’s fantastic fighting skills, it looks like Ruhk gets his fanny handed to him in this fight. Don’t mess with Hera!!! Kanan’s fate is not looking like it will be a good one. I’m still hoping he’ll make it to the end of Star Wars Rebels, and I would be SO HAPPY if he survived to be at the party on Endor. But I am not going to hold my breath that the writers will let him survive. Ezra I think will live to the time of The Last Jedi, at least. If Disney/Lucasfilm really is planning a sequel/new series, keeping Ezra alive for it would make a lot of sense. Just because Ezra would live to the time of Rey, Finn, and Poe does not mean he would be a Jedi. As it is, we still do not know whether or not Luke and Rey are the only Force sensitives/Jedi in The Last Jedi. They are just the two we know about. Finally, Mandalore is in serious trouble. The Empire seems to have developed some kind of lightning-type ray gun that can fry a person to ash without destroying the armor they are wearing. I think Sabine will live through the fight, but the odds for her family, Fenn Rau, and Bo-Katan living through it have shrunk dramatically. This entry was posted in Star Wars Characters and Stories, TV Shows and tagged Agent Kallus, Ahsoka Tano, Bendu, Bo-Katan, children's animated tv shows, Chopper, Cowboy Jedi, Dark Side, David Oyelowo, Disney TV Shows, Disney/Lucasfilm, Ezra Bridger, Fenn Rau, Freddie Prinze Jr., Galactic Empire, Garazeb Orrelios, Grand Admiral Thrawn, Hera Syndulla, Jedi, Jedi Knights, Jedi Master, Jedi Order, Jedi Purge, Kanan Jarrus, Luke Skywalker, Mandalore, Rebellion, Rogue One: A Star Wars Story, Sabine Wren, Star Wars, Star Wars Characters and Stories, Star Wars Episode VI: Return of the Jedi, Star Wars Episode VIII: The Last Jedi, Star Wars Rebels, Steve Blum, Taylor Gray, The Dark Side, The Force, The Ghost, The Noghri, The Thrawn Trilogy, Tiya Sircar, TV, TV series, TV Shows, Vanessa Marshall, Zeb on September 8, 2017 by The Mithril Guardian. You may or may not have seen my post “Star Wars Rebels’ Zero Hour and Season 3 Review.” It was a long post. In that article, one of the things about Rebels’ season three which I noted was Agent Kallus’ defection to the Rebellion from the Empire. Some people were surprised by his change of heart this season, and I admit to being taken aback that he became the new Fulcrum. Of course, this begs the question: How did I know? How did I know? There were lots of little giveaways, I think. Not many people would notice them, especially among the show’s target audience. I have been a child before. I know how they see things. I gave up on lots of characters fighting on behalf of evil as a kid, only to be blindsided with shock when they became good guys later on. It is totally understandable that kids would see Kallus as nothing but a hopeless baddy, irredeemable and undesirable. One even gave him the nickname WAFAR: Walking Advertisement for a Razor, in reference to his huge sideburns. Despite helping to create the moniker and adopting it myself, I did not see Kallus as a hopeless villain, and below are some of the reasons why. 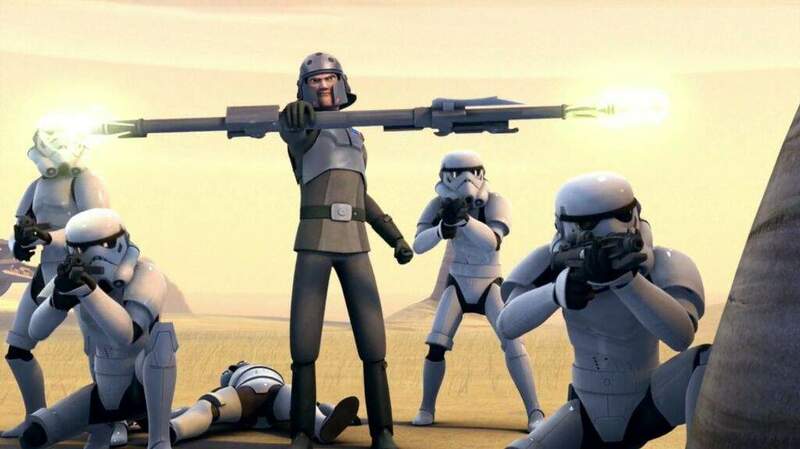 From the get-go, I noticed that Kallus did not mind going into battle at the head of a legion of Stormtroopers. When Vader steps on the scene, he is usually the central point of the conflict. He is neither with the Stormtoopers nor goading them on from behind. If there are Stormtroopers present when Darth Vader enters the scene, they are in the background, firing at the heroes. Vader takes center stage whenever he shows up. Kallus was different. He was not in front of the Stormtroopers, like Vader typically is, he was in the front line with them. This is also a departure from the aloof attitude demonstrated by most Imperial officers. They are all safely behind the Stormtroopers when they appear on screen. We have never really seen an Imperial officer, agent, or other bigwig dive into the thick of a fight against the Rebels. The obvious reason for this is that the Imperials are perfectly willing to dish out the pain, but they are not willing to experience it themselves. Kallus is different. He is willing to fight. He is willing to brawl. Whether he is using a blaster, his Lasat bo-rifle, or his own fists, he enjoys the thrill of combat. He is not afraid of getting hurt, though he is not reckless and does not wish to get himself killed. Nevertheless, from the start it was obvious that he enjoyed a good scrap. This, I think, was my first hint that Kallus had the makings of a Rebel. Another hint was that he was not prone to preening, as most Imperials in Star Wars are. I do not recall seeing Kallus boast over anything he did while with the Empire, even his successes as an ISB agent. One Star Wars encyclopedia claims that he turned down numerous offers of promotion in order to stay on the front lines. So he did not have an unhealthy, inflated opinion of himself. Hmm, not your typical Imperial reaction to success, eh, readers? To the observant viewer, this shows that Kallus is not interested in power or advancement in the Imperial bureaucracy. He is interested in his job as an ISB agent because he enjoys it. He wants to be on the front lines, fighting what he thinks is the good fight. His scrupulous attention to his job, his lack of interest in prestige and power, his love of combat because he is at his physical peak, hinted that he had a sense of honor. Though he kicked a Stormtrooper down a Kessel mineshaft and did some other, similarly nasty things, Kallus definitely possessed an aura of real dignity which is lacking in most of Star Wars’ Imperial characters. Hint number three about Kallus’ eventual change of heart was that he was smart. Most Imperials are so busy trying to “get ahead” in the Imperial power structure that they have lost whatever imagination they had before they became part of the Emperor’s machine. You watch them while they are working on the bridge of a Star Destroyer or some such place, and they are all vying for “their fair share” of the glory. This means that they never look beyond their own nose. Because they are so busy looking out for good ol’ Number One, they do not understand the Rebels. The Rebels would never leave a man behind if they could find a way to save him. Kallus realized this at the start of the series and, like Grand Admiral Thrawn, he began to profile our heroes. He did not do it through studying art, as Thrawn does, but by assessing their actions in combat. There are benefits to both kinds of deduction, obviously. Thrawn’s fascination with art and what it shows about a particular artist’s or species’ mindset is a superpower all by itself. It is what allows him to make such great, overarching plans. If there is one thing Thrawn is proud of it is his intellect, the fact that he is the smartest man (or Chiss) in the room, and so he holds all his subordinates and enemies in contempt. Kallus’ understanding of the Rebels is based more on their performance in combat, and so he never held them in complete contempt. Kallus is not a genius, like Thrawn, but he is intelligent. He analyzed the Ghost crew’s patterns of attack and would be ready to meet them when they came running to the bait he had set up. His hand-to-hand battles with the Ghost crew, particularly Zeb, taught him their personal strengths and weaknesses. In a way, this knowledge gave him a more realistic and basic picture of the Rebels than the one Thrawn has drawn up. Thrawn understands how they think; Kallus knows why they think the way they do. Thrawn is detached from his knowledge of the Rebels. With very, very few exceptions, he has not engaged them in personal combat. He has studied their tactics, yes, but he has done so through secondhand reports. Though thorough, these reports do not equate to actual experience. Kallus has not engaged the Rebels simply with his head but by fighting them physically. He knows, therefore, that they will do the totally unexpected, not because of a picture they painted on a wall or a mask they left lying around. They will do the totally unexpected because they are determined to survive long enough to get a Rebellion against the Empire up and running. If someday they have to die so that a Rebellion can be born, then they will do it. But if they can find a way to survive they will take that chance, however slim or insane it seems to be. That is all there is to it. Thrawn thinks he can synthesize thousands of years of art and battle tactics into an efficient metric by which to plan out the perfect battle. To an extent, he is right. But what Kallus knows and what Thrawn has not recognized is that heart beats brains every time. The Ghost crew’s determination to win, to look out for each other, trumped his every plan to bring them to face what he believed was justice. And all of his plans were remarkably neat, for an “average” Imperial. So how can someone so smart get beaten so often by people who, logically, should be easy to defeat? The writers finally answered Kallus’ question in The Honorable Ones. After bushwhacking the crew in an Imperial factory orbiting Geonosis, Kallus follows Zeb as the Lasat tries to return to the Ghost via an Imperial escape pod. The two end up fighting while the escape pod jettisons, damaging the controls in the process and landing on an ice moon as a result. Zeb is knocked cold by the landing while Kallus breaks his leg. The episode is actually nothing special, from the point of view of the plot. Two enemies who hate the other end up stranded together and have to work with one another if they hope to survive to rejoin their respective forces. We have seen this device used time and time again. It is not a particularly spectacular plot and, if handled badly, it leaves an awful taste in viewers’ minds. But The Honorable Ones pulls it off very well – and not just because of all the “freak-out noises” Kallus makes. Having watched Zeb for so long, we know how he is going to react when he realizes that Kallus cannot fight because of his busted leg. 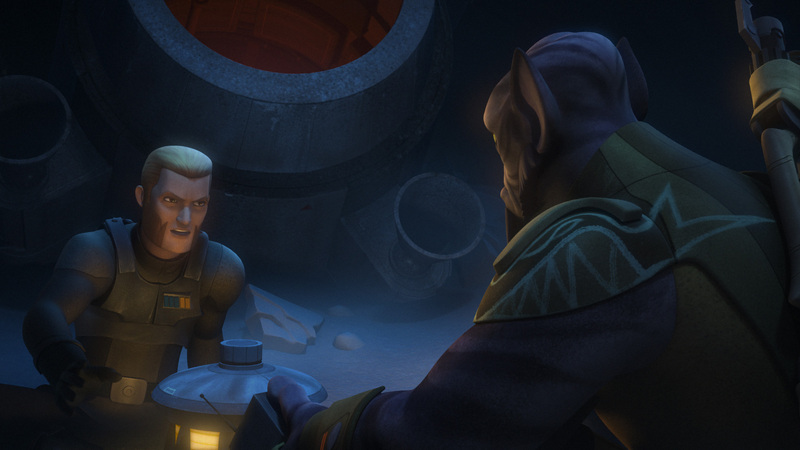 Kallus, however, believes that Zeb will take the first opportunity to kill him. He repeatedly tries to get his hands on a weapon, but Zeb disarms him and does not hurt him, in spite of pointing out how easily he could kill the ISB agent. Zeb then makes a crack about how Geonosis is supposed to be a desert planet. He knows very well that they are on one of the planet’s moons – a frigidly cold one, at that. But in order to ease the tension of their situation, he makes a joke about it. Kallus misses the joke and takes him seriously. He lectures Zeb as though the Lasat was a child, asking how he could be bested time and again by an ignoramus like him. Zeb’s curt reply – “Get a sense of humor, Agent!” – must have surprised him. Due to a bad experience with a Lasat mercenary some years before, Kallus held all Lasat in contempt. Because of this past encounter with a member of Zeb’s species, he probably knows more about the Lasat as a race than anyone but Zeb and Thrawn. This hatred of his for the Lasat blinded him to their better qualities. So Zeb pointing out that he was joking and Kallus not grasping it is one of the things that makes the Imperial agent sit up and pay attention. Zeb is not a genius but neither is he stupid. He was having a bit of fun at their expense, like any soldier who still held hope of rescue would. If Zeb had been a human or a fellow Imperial, Kallus might have understood that his comment was a joke. Instead, his bias blinded him to Zeb’s sense of humor. Throughout the episode Kallus slowly learns to take off his dark glasses and look at Zeb as he is and not how his hatred has painted him. What he finds is an intelligent, honorable Lasat who is tactically bright. He also realizes that Zeb has something he does not. Several somethings, actually…. He has friends. Friends he believes in and trusts to come for him no matter what. Friends he knows will risk their lives for him because they have done it over and over again. Friends he will in turn risk his life to protect and help. Kallus has no friends, not because he does not want them, but because they do not want him. With the Imperials, friends are extra baggage. They can get you demoted or put you on the chopping block for their mistakes. The Galactic Empire of Star Wars reminds me a great deal of Lewis’ description of Hell in The Screwtape Letters. Almost everyone in the Empire loves nothing greater or better than himself. They all hate each other to some extent and cannot wait to show up the person sitting next to them so they can climb the ladder to the Empire’s upper echelons. And in The Honorable Ones, this is what Kallus finds out. He finds out that he has not been fighting for the right side at all. He has been working for an evil Empire, doing evil deeds in its name. The way this is shown in the episode is when he apologizes to Zeb for what happened on Lasan. The initial mission statement was not to massacre the Lasat. At least, this was not the mission statement that Kallus and everyone below him saw. The Empire meant it to be a massacre from the beginning, but they knew that not all of their soldiers would gleefully agree to exterminate an entire species. So the Empire had to feed them this idea that they were fighting just one little battle but it spiraled out into an inevitable world-clearing assignment. The real clincher comes at the end of the episode, when Kallus watches Zeb’s reunion with the Ghost crew from a distance. The kids rush up to Zeb, shouting with relief, while Hera offers the milder, “You had us worried,” line. Kanan’s brash, “I told you he was all right,” is the more manly way of expressing relief. It is clear that the crew is genuinely happy to see Zeb, that they love him as part of their battle family. Kallus’ reception aboard the Imperial Star Destroyer is the exact opposite. No one rushes up to see if he is okay or even to take him to sickbay for his broken leg. The one man aboard whom he knows by name, Admiral Konstantine, has his nose in a datapad when Kallus tries to get his attention. Konstantine’s brush-off is totally at odds with the Ghost crew’s joyous discovery of Zeb, alive and well, on that Geonosian moon. Disappointed and shocked that no one aboard cared whether he lived or died, Kallus limps to his austere quarters and sits down on his bed. The one colorful thing he has is a meteorite Zeb found and gave to him because it generated heat, which Kallus needed more than he did because he could not walk. Somehow, I think Kallus realized then that, if he and Zeb had been friends and he had been lost, the big Lasat would have welcomed him back to the ship heartily. 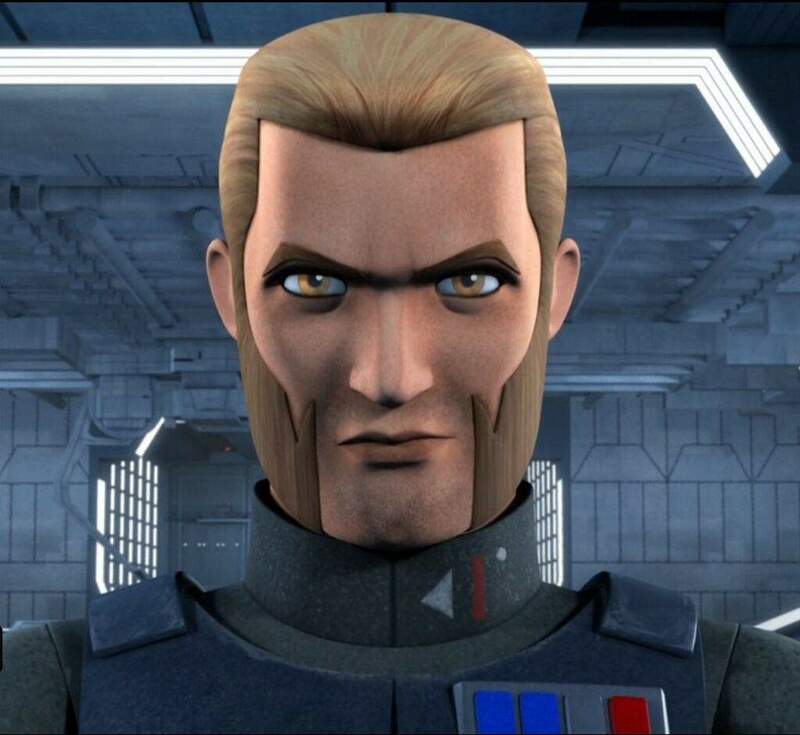 Though he always respected the Rebels’ fighting abilities, Kallus finally realizes after this episode that they are in the right and he has been wrong this whole time. It must have hit him hard; finding out that you have been fighting for and doing the work of someone evil is pretty awful. But the interesting thing is that Kallus does not let his feelings overwhelm and destroy him. Instead of staying in bed, wracked with guilt, he follows Zeb’s advice: he starts asking questions, looking into what the Empire is actually doing, not what it says it is doing. The answers he finds spur him to join the Rebels as a spy, feeding them vital information from the first episode of season three onward. Despite not being a hundred percent successful in helping the Rebellion all the time, Kallus’ information comes in handy more often than not. It is so valuable, in fact, that when the Phoenix cell gets word he might be discovered, they try to get him out of the Empire. In this way, they recognize Kallus’ true value more than he does. They see Kallus as more than a useful tool that can get them intelligence which could mean the difference between life and death. They see him as he is: a man of inestimable worth in and of himself, a man who does not deserve to be murdered by the Empire. They are willing to sacrifice any future lifesaving intel he could gain to save his life. But Kallus’ more practical, Imperial-tinted view of his role in the Rebellion means he is not yet ready to break away from the Empire. He stays behind to keep feeding the Rebels information, feeling he can do more good from the inside than from without. A noble idea, certainly, but in the end his decision is almost disastrous. Thrawn uses Kallus’ next transmission to find Phoenix Squadron’s base, methodically destroying the Rebel fleet assembled overhead to put a halt to the TIE Defender factories on Lothal. Kallus’ warning barely alerts the Rebels in time, allowing them to mount a defense against the attack. It is, however, a costly defense, with many Rebels lost in the battle, along with most of the supplies they stored in the base which they are just able to abandon. Kallus is forced to watch the people he decided to help get killed before his eyes, held as he is aboard the Chimera’s bridge, powerless to act on their behalf. Though he eventually manages to escape it is clear he is not very happy with the day’s events at the end of Zero Hour, Part 2. It is not too hard to guess why. Kallus thought he could be of more help to the Rebels from inside the Empire, that he could be useful to them as a spy. Instead he got them discovered, which led to many of their men being killed in action and lost them a well-stocked hidden base. He is lucky that they decided to take him in despite all that, which is why he thanks Kanan for accepting him. Kanan, through his Force-sensitivity, must sense what Kallus is feeling. He also knows the man will not accept coddling. He cannot. He is a grown, responsible adult, which means he has to deal with his feelings as an adult should. This does not mean that Kanan cannot tell him how much the risks he took on behalf of the Rebellion, on behalf of the Ghost crew, mean to them. He thanks Kallus for risking so much for them, for doing the right thing. Kallus’ expression after Kanan leaves is very interesting. In fact, it is comparable to Ezra’s expression after he helps Sabine and Zeb take crates of food to feed hungry Lothal refugees in Spark of Rebellion. After one of the denizens of Tarkintown thanks Ezra for the food, thinking he is part of the Ghost crew, Ezra’s face falls with shame. “But I didn’t do this,” he mutters. “I didn’t do anything.” He was looking out for himself when he got caught up in the Ghost crew’s raid, but the people in Tarkintown did not know that. To them, he is a new member of the crew of benefactors that supplied them with the necessities they could no longer acquire themselves. This leaves Ezra feeling guilty, a guilt which helps spur him to join the Rebellion because it helps bring him out of himself, showing him that there is a larger battle to fight. That he can, in fact, make a difference and help people in a way that matters. Kallus is a big boy, and sooner or later he is going to realize that this assessment is not entirely true. Yes, he was not an enemy of the Empire from the beginning. Yes, he fought and killed Rebels before he joined their fight. Yes, he will be making up for lost time now that he has become a Rebel. But he did risk his life to give the Rebels important, lifesaving information. He did warn them in time, not just in Zero Hour but in Warhead as well. He did throw off Governor Pryce’s command capabilities by upsetting her, reminding her of the consequences of failure in the Empire. He did, at last, escape the Empire’s clutches and join the Rebellion. He is, finally, becoming more of the person he was meant to be. That makes him pretty darn important. It makes him worth thanking. It makes him worthy of the Rebels’ respect. And it is going to make him a heck of a Rebel, readers. I cannot wait to see him kick some Imperial backside in season four! Journeying with Kallus has been almost as much fun as following along with the Ghost crew. I hope he gets to the party on Endor at the end of Return of the Jedi, where our Phoenix Squadron friends can slap him on the back and offer him some of the local cocktail. 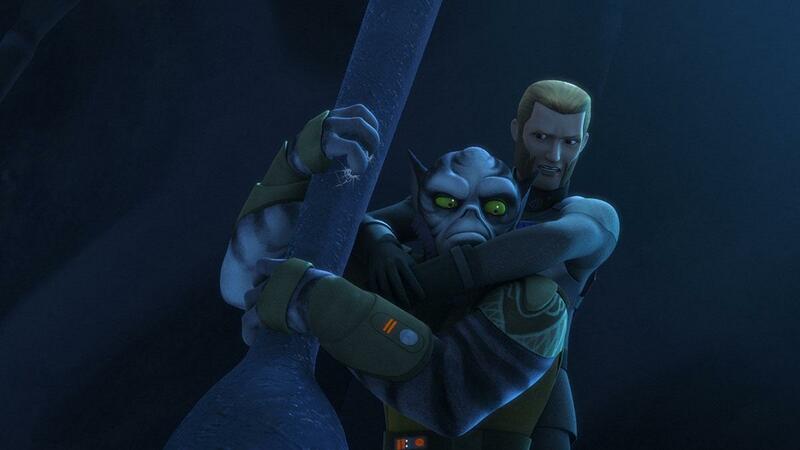 Maybe, in whatever series follows Rebels, we will get to see more of Kallus. He is an intriguing character I would hate to lose as a viewer. As a writer, I would have to have a pretty good reason to kill him off. But we will have to wait and see what Dave Filoni and his crew have in store for our heroes. The final season of Star Wars Rebels is going to big and probably painful on a series of levels. As the song says, “We may lose and we may win/But we will never be here again/So open up, I’m climbin’ in.” I’ve followed the Ghost’s hyperspace vectors this far, readers. I cannot turn back now. If you have come this far with us, I know it is the same for you. So…may the Force be with you, readers and Rebels alike! This entry was posted in Spotlight!, Star Wars Characters and Stories and tagged Admiral Kassius Konstantine, Agent Kallus, Anakin Skywalker, Bo-Katan, callous, children's animated tv shows, Chopper, Darth Maul, Darth Vader, Dave Filoni, David Oyelowo, Dee Bradley Baker, Disney, Disney Star Wars, Disney TV Shows, Ezra Bridger, Freddie Prinze Jr., Galactic Empire, Garazeb Orrelios, George Lucas, Grand Admiral Thrawn, Han Solo, Hera Syndulla, Hondo Onaka, Kanan Jarrus, Lars Mikkelsen, Lucasfilm, Luke Skywalker, Mandalore, Mandalorians, Merriam-Webster Dictionary, Mon Mothma, Princess Leia, Rebellion, rebels, Sabine Wren, Spotlight!, Star Wars, Star Wars Characters and Stories, Star Wars Episode IV: A New Hope, Star Wars Episode V: The Empire Strikes Back, Star Wars Episode VI: Return of the Jedi, Star Wars Rebels, Star Wars: Spark of Rebellion, Steve Blum, Stormtroopers, Taylor Gray, The Eagles, Thrawn, Timothy Zahn, Tiya Sircar, TV, TV series, Vanessa Marshall, Zeb on June 14, 2017 by The Mithril Guardian.